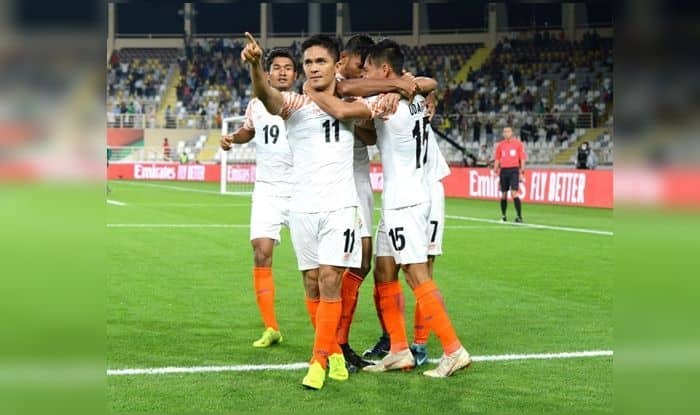 If Thailand was big, India are faced with a bigger test in hosts United Arab Emirates in the AFC Asian Cup on Thursday, overcoming whom will require them to play out of their skins. Four days after creating a flutter with a stunning 4-1 drubbing of Thailand, India are now looking an upbeat lot in the continental showpiece. While the result against Thailand, who have three J-League players in their ranks, was no mean feat, it will be a bigger achievement if the Indians are able to put it across the hosts who are gunning for the title. Currently ranked 79th to India’s 97th, the United Arab Emirates were placed as high as 24 in the FIFA chart in January 2015. Coach Stephen Constantine will be pleased with how the second half against Thailand turned out. India not only managed to shut down a lethal Thai attack after being tied 1-1 at the break, but also threatened at the other end through quick transitions in attack. That stupendous show earned India three valuable points, a place on top of the group and a goal average of plus three. “We have a very young side here and they are excited. Of course, hosts UAE will be a different game. They are a very good side but they are just another team standing in our way,” said Constantine. As far as the Indian team is concerned, Sunil Chhetri hogs the limelight wherever he goes, and the Blue Tigers will again look up to him upfront. It will not exactly be appropriate to say that Chhetri will be high on confidence after his double strikes against Thailand, which saw him go past Argentine superstar Lionel Messi in the goal-scoring chart among active international players, because that is an ingredient the Indian talisman never lacked. He is never overconfident, though. In a team sport like football, a squad heavily dependent on Chhetri would not have experienced a 13-match unbeaten run on way to qualifying for the tournament. Over-reliance on the 34-year-old striker would not have seen them maul Thailand the way the did. However, the surprise package was rookie forward Ashique Kuruniyan, Udanta Singh being the livewire down wide right. Udanta, in fact, set up a couple of goals including the inch-perfect cross from right flank, which Chhetri slammed home for India’s second goal. India can expect the UAE to come hard at them after a 1-1 stalemate against Bahrain in the tournament opener. They wouldn’t be satisfied with their performances, especially in the attacking third. It was the late goal by substitute Ahmed Khalil that saved them the blushes. India will hope to not get carried away by all these, something their coach stressed a day after the win against Thailand. “We don’t go into a match expecting to win 4-1 or 5-1. However, we are not trying to get carried away with the emotion. We still have two games left and we still need another two points to qualify from the group stages,” Constantine had said. “After we have qualified, we can get a little bit excited, but our primary job is still to qualify out of the group stages.” Only time will tell what’s in store.